The aromas of cinnamon, coffee, and pumpkin spice, a telltale sign of the approaching fall season common throughout the US, fill the storeroom of the small coffee roaster. Here, I feel far removed from the Harenna forest in Ethiopia and the focus of our project with Kono Coffee. Removed however, I am not as this is just as important as any of the work we hope to achieve. In fact, all of the goals that we have laid out before us are dependent upon this key stage….perfecting the product! A timer begins to beep… signifying that the coffee has been steeping for four minutes and marks the commencement of our coffee cupping. I stick my nose daringly close to the scalding hot black liquid before me. Inhaling deeply, I try and decipher the complexities of the aroma given off by each of the three coffee samples. 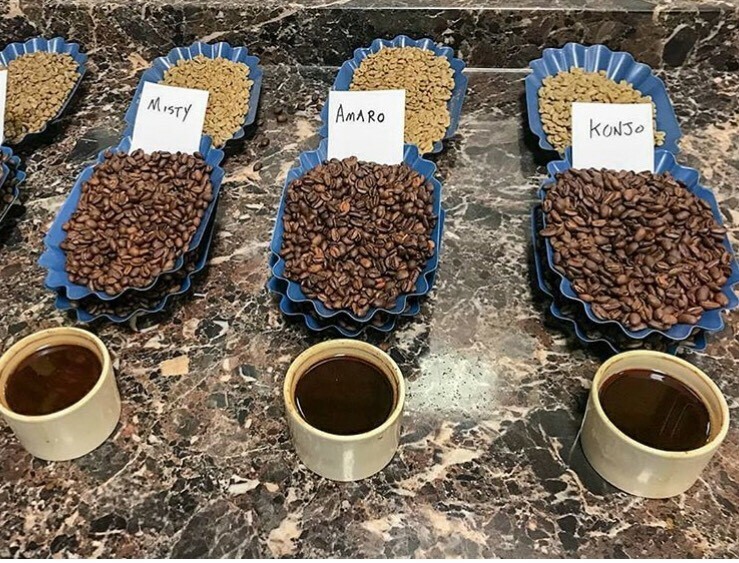 They vary only slightly in the temperature they were heated to before being pulled out of the roaster, yet compromise three weeks of repeated roasting, cupping, assessing and re-roasting. Somewhere in front of me sits the perfect cup, the best that our coffee can be. “Is that apple I detect?” thinking to myself. Most likely not, as my ability to interpret what my nose is picking up is novice to say the least, and the main reason why I am accompanied by the owner and an employee of Union Place Coffee Roasters. 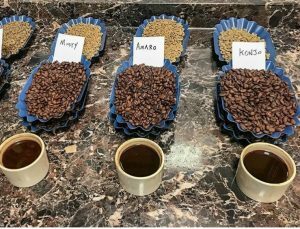 Given the amount of time spent on preparing, processing and transporting these beans from their origin in Ethiopia to Upstate New York, I believe that this stage deserves just as much attention, hence the presence of experts. We each have the three samples before us and before long the sounds of slurping fill the small room. “Tastes like coffee,” I think as I, too, pull a spoon full of each of the samples into my mouth in the same slurping fashion. Although this slurping is intended to aerate the coffee and amplify its flavor, the subtleties of the tastes swirling around in my mouth are lost on me. We continue for another 10 minutes. Sample, slurp, take notes and repeat. Even after all that slurping, I was still tasting coffee, and maybe even good coffee. So why all this fuss over a cup of coffee? What does any of this have to do with our project and these ‘goals’ we have laid out before us? To put it bluntly, everything. 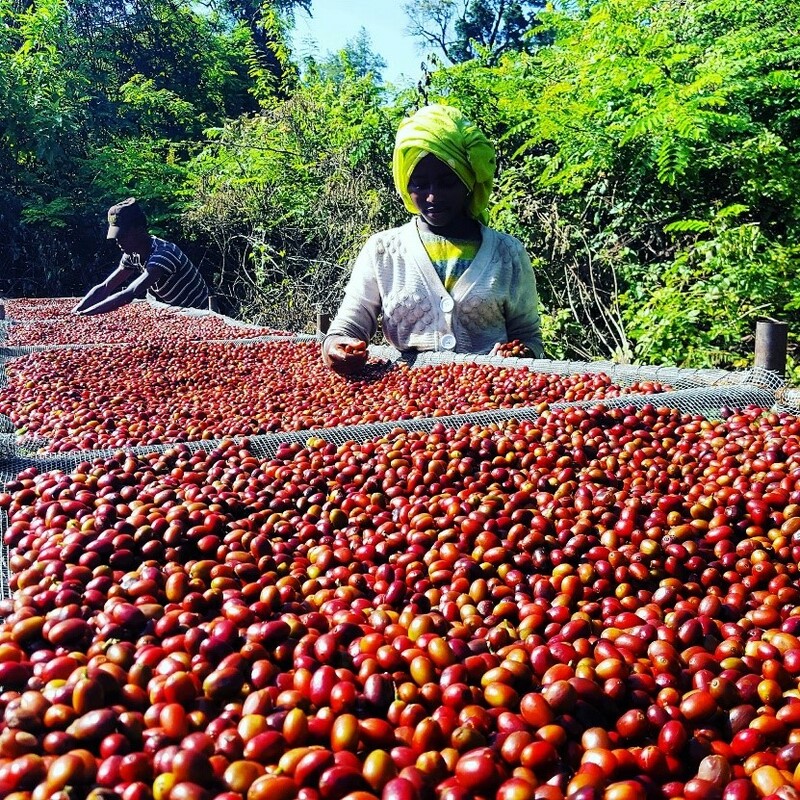 In our effort to stem the over utilization of natural resources and alleviate some of the pressures placed on Bale Mountains National Park (BMNP) by forest communities, we have developed a business model that is centered around the sale of high quality wild coffee from the region. 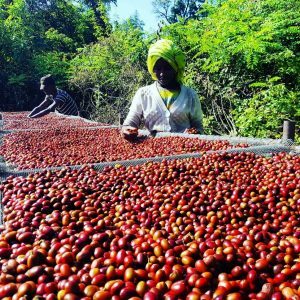 Utilizing our low-tech processing system, we can ensure that we produce only the best coffee but that comes at a cost. 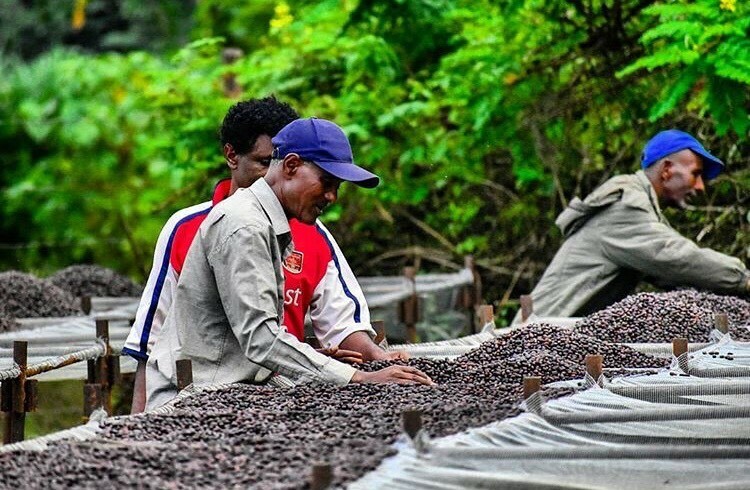 We pay higher premiums for properly harvested coffee; we provide high paying seasonal employment, and we are also implementing a series of profit sharing schemes that focus on promoting forest regeneration. We are also contributing to the sustainable development of communities and the development of new sustainable alternative livelihoods as well. If all goes according to plan, we hope to create economic incentives for locals to protect the forest and its wild coffee, thereby establishing a community-based buffer zone between the Park and land conversion around the southern end of BMNP. This all comes at a significant cost however, and for our business to remain viable we need to ensure sales which is dependent upon producing a quality product. 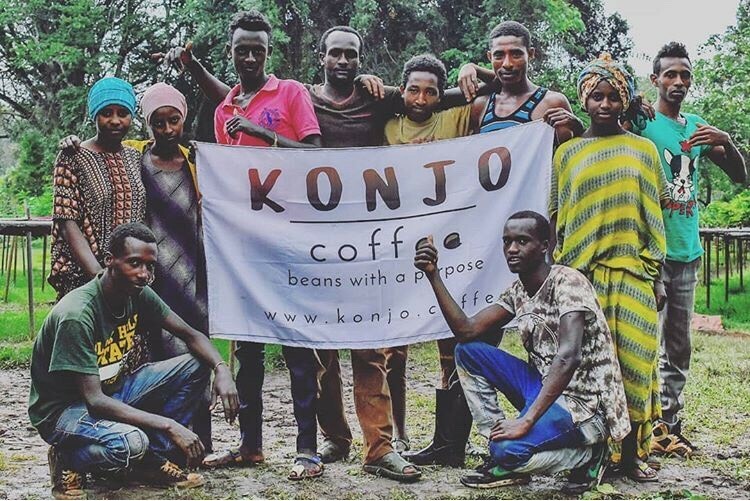 Although our coffee is backed by a unique story, without high quality, it is just a story and a lot of coffee that no one will buy. Far removed from our work on the ground, successfully navigating our end market and business operations in America is crucial for turning this idea into a reality and meeting our conservation goals. A feeling of relief comes over me. Finally, after all this time and through all the struggles, we have confirmed that we have a solid product.